Square D 30A 3P3W 600V Nema type 1 indoor fusible safety switch. Use with Edison type ECSR RK5 600V fuses. Square D 60A 3P3W 600V Nema type 1 indoor fusible safety switch. Use with Edison type ECSR RK5 600V fuses. 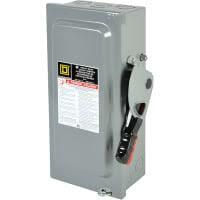 Square D 100A 3P3W 600V Nema type 1 indoor fusible safety switch. Use with Edison type ECSR RK5 600V fuses. 1 n.o./1 n.c. contact interlock switch kit for use with Square D 30A 600V fusible and non-fusible safety switches.